Naoto Kan's popularity plummeted in the wake of the devastating March 11 earthquake and tsunami. 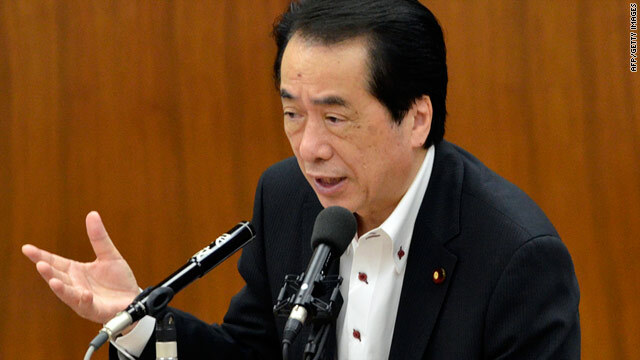 Tokyo (CNN) -- Japanese Prime Minister Naoto Kan said Wednesday he'll resign once new bills related to post-earthquake reconstruction pass parliament, to avoid a political vacuum. He's expected to step down by the end of August. "I will put my words into action once those two bills are approved at the Diet," promised Kan at a Lower House committee session, before it approved one of those measures: a deficit-financing bond bill to fund the government's disaster reconstruction plan. Kan has been facing strong pressure even within his own party to step down, with plummeting popularity in the wake of the devastating March 11 earthquake and tsunami, followed by one of the worst nuclear crises in history. The prime minister has said he'll resign on the condition that two bills are passed -- the deficit-financing bond bill and the new energy promotion bill -- which he believes push forward his reconstruction policies. Kan's Democratic Party of Japan and the biggest opposition party, the Liberal Democrats, agreed to pass the two bills through the upper and lower Houses by the end of August. One of Kan's cabinet members said the change in the government would not change the government's energy policies. "The government is in transition, but everyone is on the same page as far the nuclear policies, (and agree that they) are the most urgent policies to deal with," Goshi Hosono, the state minister in charge of the nuclear crisis, said in an interview with a group of foreign journalists Wednesday. Hosono also revealed that Japan will create an independent regulatory body for nuclear safety, stripping that role from the Ministry of Economy, Trade and Industry, which currently oversees and promotes the nuclear industry.